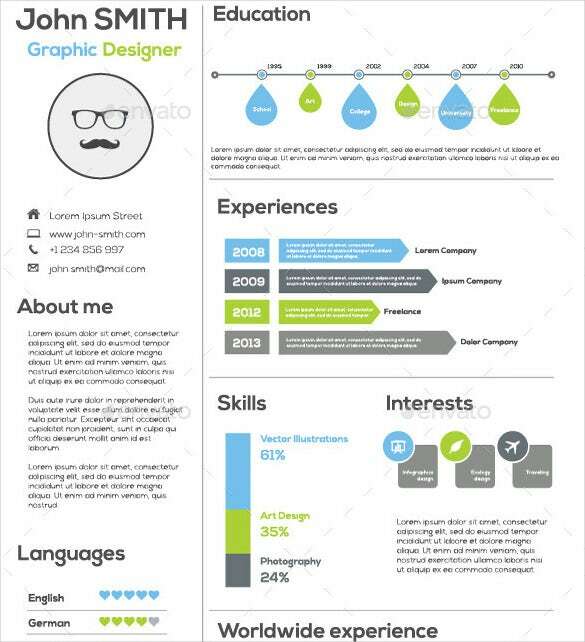 33+ Infographic Resume Templates – Free Sample, Example, Format Download! 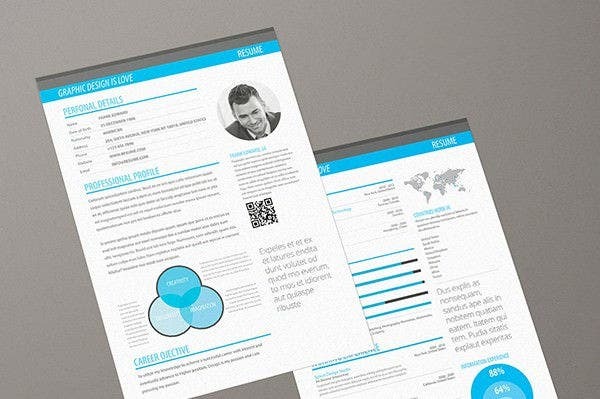 Your hunt for the best resume templates can leave you with information overload, unless you’re lucky enough to find an informative free infographic resume templates list to refer to. Of course, you give yourself the best chance of succeeding with your job application with a classy, unique and relevant resume templates to vouch for your credentials. Contemporary resume templates come to you in functional forms which can then be fine-tuned to suit the job application you’re contemplating, and are also available as niche resumes for applying to job such as marketing consultants, contractual doctors, information technology engineers, financial planners, bank officers, and more. 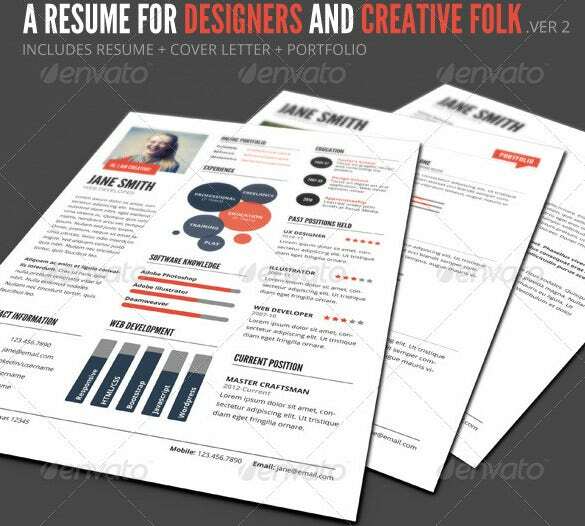 You can also see Creative Resume Template. 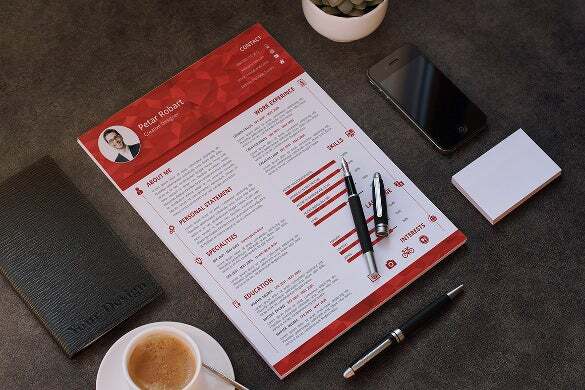 If you are looking to assure a cutting edge appeal to your CV, this free download InfoGraphic style resume template will be a sure-shot winner. It also allows you to place your picture and own tagline. 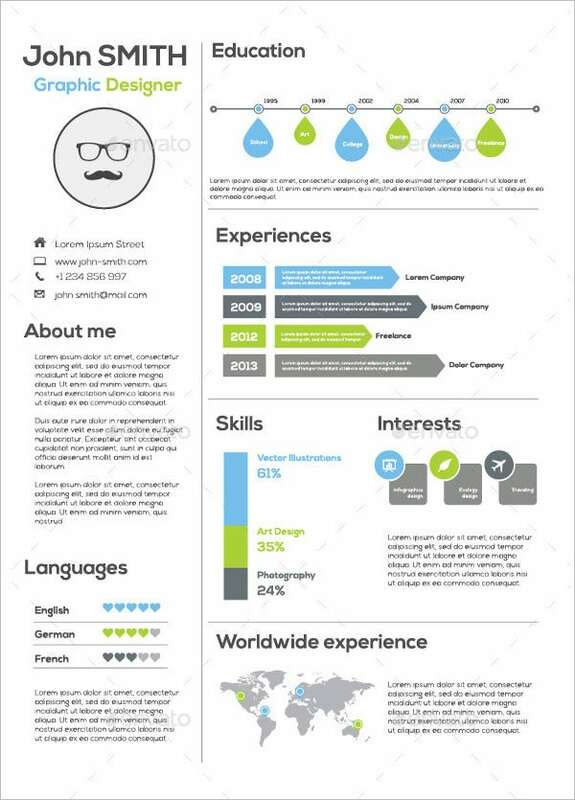 If you are enriched with professional experience internationally, this sample infographic resume template would be great with its world map. The cartoon picture and cute infographics add a fun quotient to the CV. 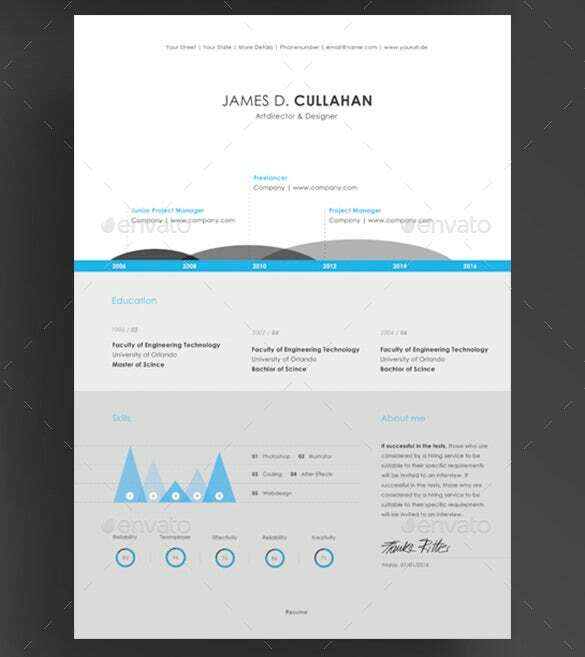 If you are looking for a synoptic resume structure, this minimalist info graphic resume template example would help you with its neat structure and more infographical presentations rather than texts. 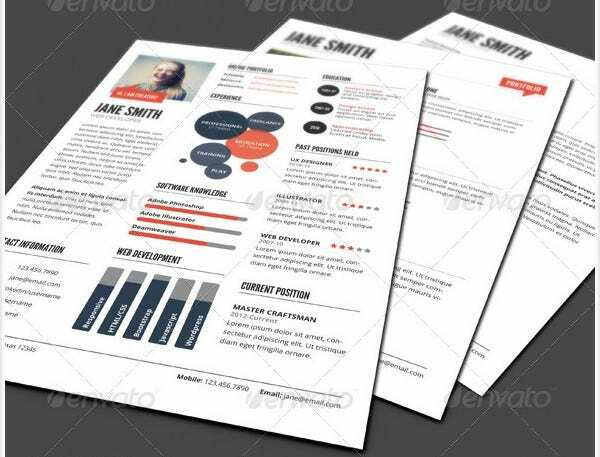 Not only do these resumes ensure that you are able to create a professional and impactful resume in little time, but also bless the document with an unmatched aesthetic appeal that is bound to catch the fancy of the evaluator. 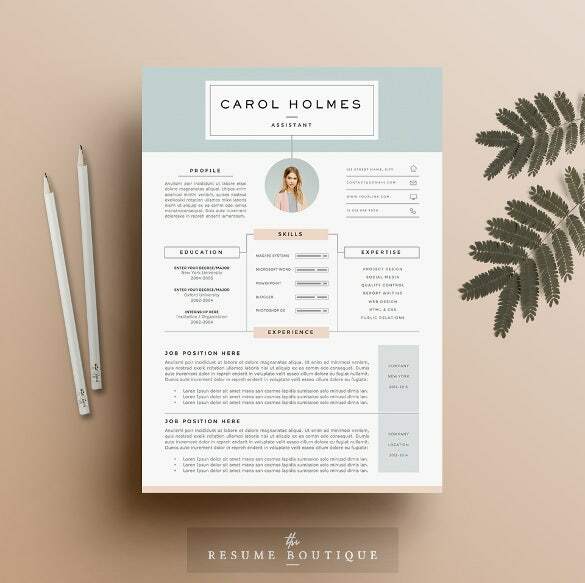 Right from no frills one-page resumes to dazzling resumes with changeable coloured backgrounds, stylized fonts and placeholder icons – the world of resume templates is rife with some sizzling options for you. 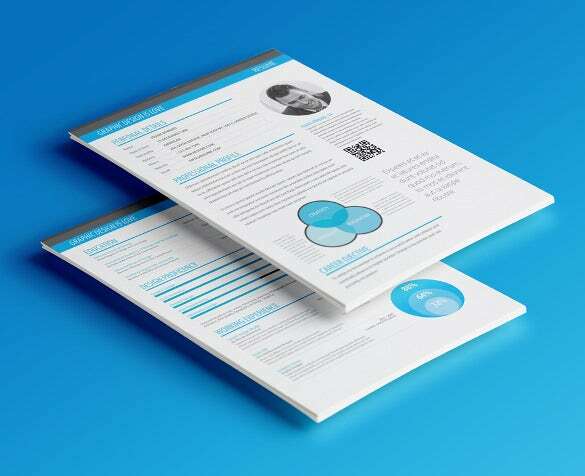 Pick a resume template that suits the nature of the job you are looking to apply to and build upon it to create a winning resume that you can trust. see this administration Resume Templates. 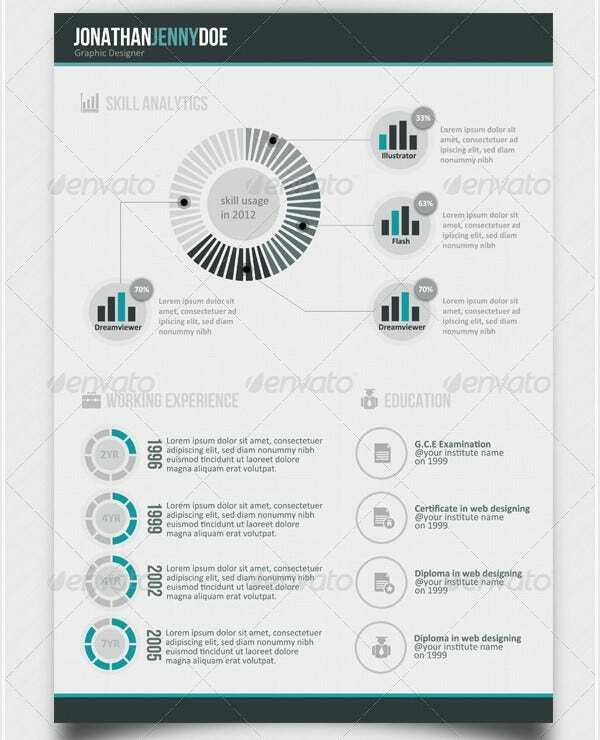 It is rightly said that a pictures speaks a thousand words and the same holds true when it comes to infographic resume. 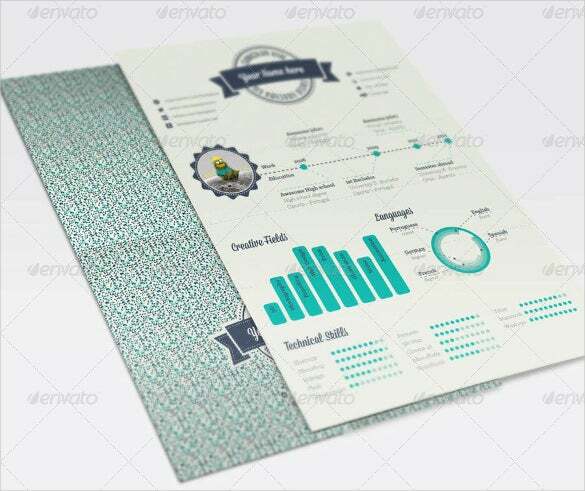 One of the latest in the trend is the infographic resume which not only looks visually attractive but also provides details of the candidate in a neat and well organized manner. 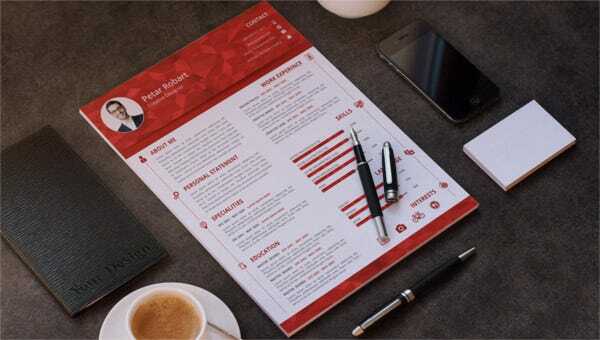 Drafting a good infographic resume is a time consuming and a tricky task and thus to help you with the same, various infographic resume templates are available. 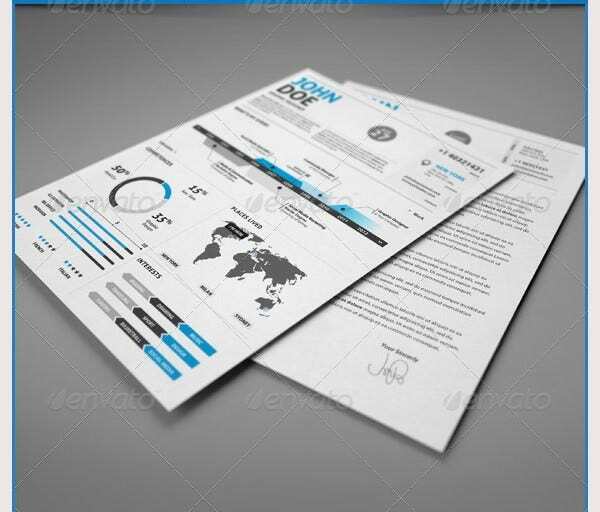 Not only for the ones who lack in time, these types of templates are also of great use for all those people who does not have good hands in designing but wish to draft a professional looking infographic resume. 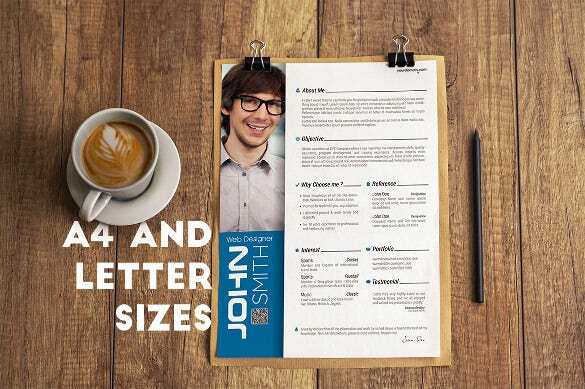 Perfect for the candidates who are looking for creative jobs, these templates can also be used by others depending upon their requirements. You can see also blank resume templates. Majority of these templates are drafted using software’s like Adobe Photoshop, Adobe Creative Suite, Adobe Illustrator and others. As a job seeker one must have noticed that there is extensive competition in store and one should also note that in the days ahead, it is only going to get stiffer. Hence, that is where one needs to think out of the ordinary. The key will be to look at ways to stand out in the crowd. Speak to any expert and most will insist on carefully planning the resume. It is the first thing, which any interviewer will see and it becomes essential to create an instant impact. In such a scenario, there is certainly to scratch the brain and come up with something stunning. 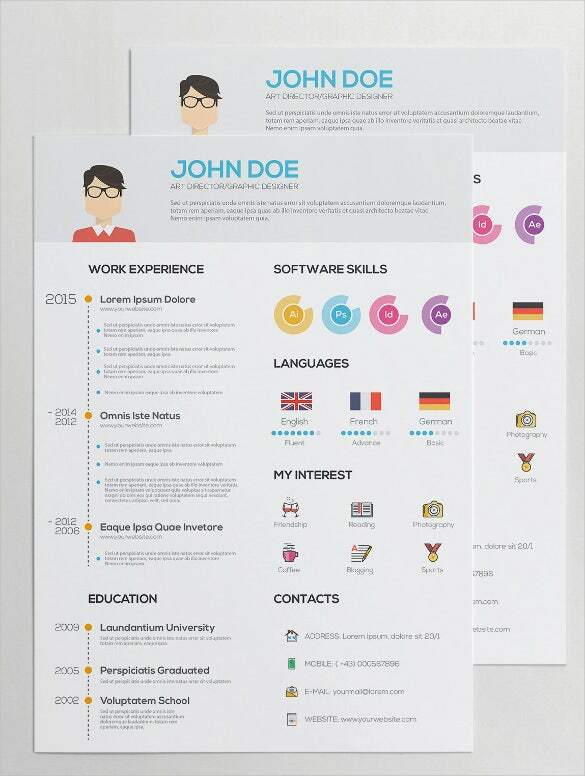 Here again experts are of the opinion that presenting the resume in infographic style can certainly work wonders and bring your resume into immediate focus. You can see also Microsoft resume templates. > What is it Precisely? 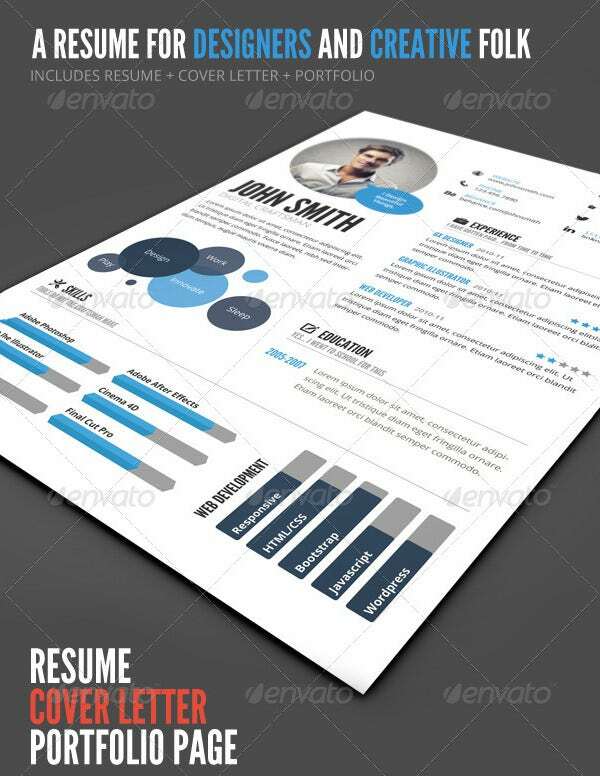 One must note that today we reside in a visually driven world and that has probably made the infographic CV template a hot favorite amongst job seekers. The presence of visuals on the resume certainly catch the attraction of any interviewer and that puts you into immediate focus. 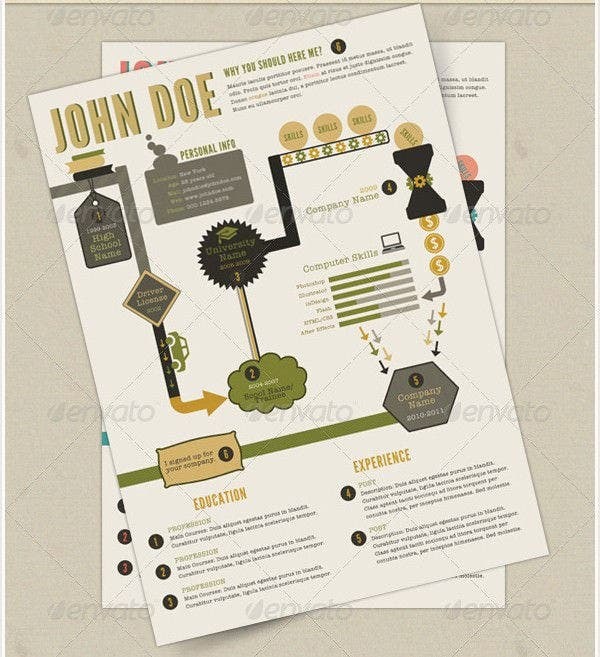 > How to Access Infographic Resume Templates? 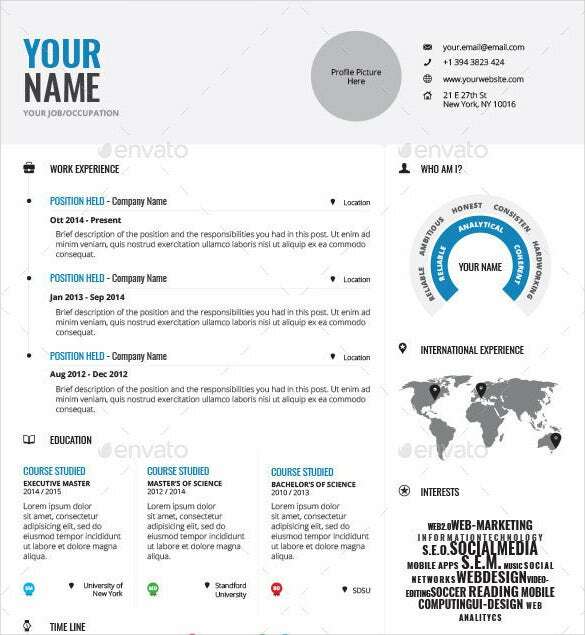 Hence, with the intent of giving the resume a perfect makeover, one can look to avail infographic resume templates. 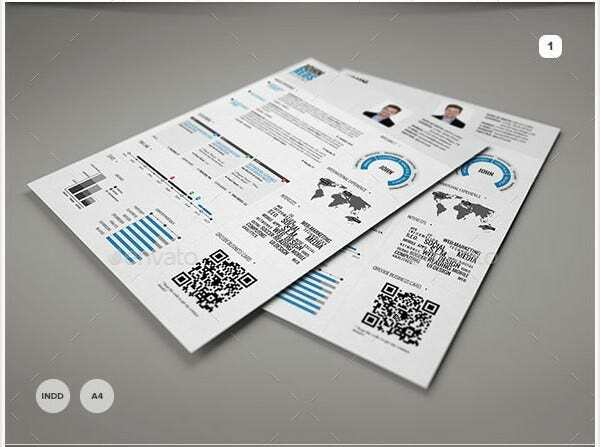 Browsing Google is perhaps the ideal option in such a scenario and one should stumble upon plenty of infographic resume design options. 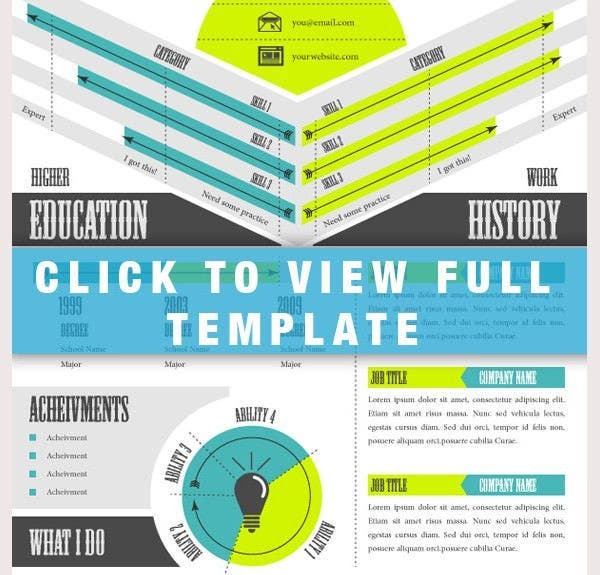 One should note that most of these templates and free infographic resume in Microsoft word and that certainly means someone who intends to download a version will not have to spend a penny. 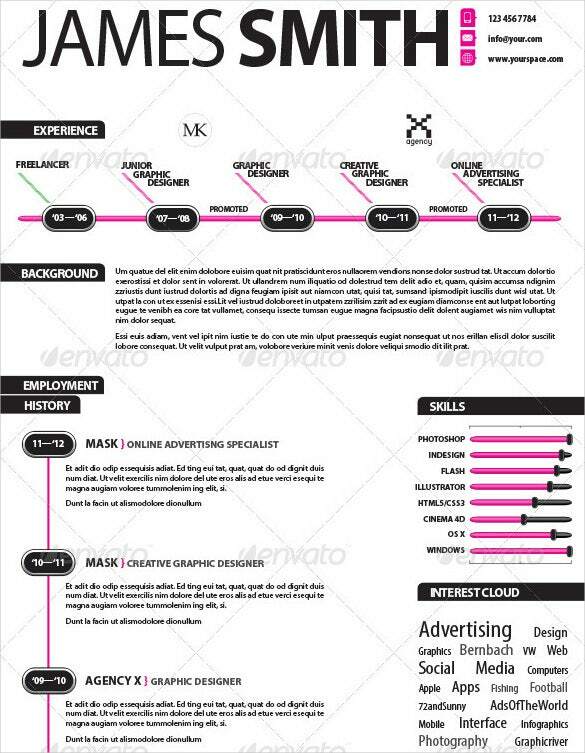 However, just downloading any infographic CV template option may just not be ideal. There is a need to keep an eye on a few factors. Hence, let us discuss it in brief. 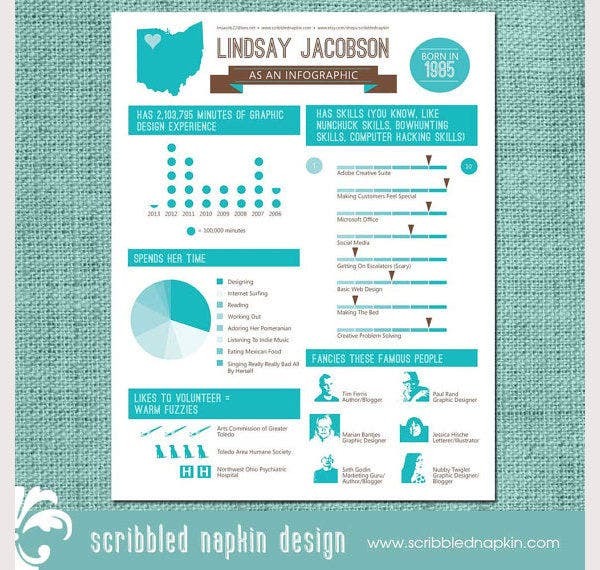 > What to Look into while Selecting an Infographic Resume Template? It is true that in a Google browse one will simply be spoilt for choice. 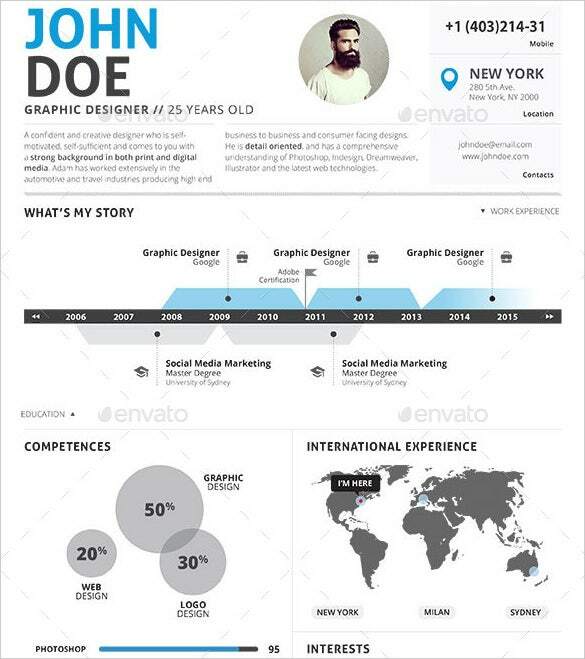 However, someone looking for infographic resume free download needs to choose wisely. The key will be to go through the options and then select something, which should create an immediate positive impact. 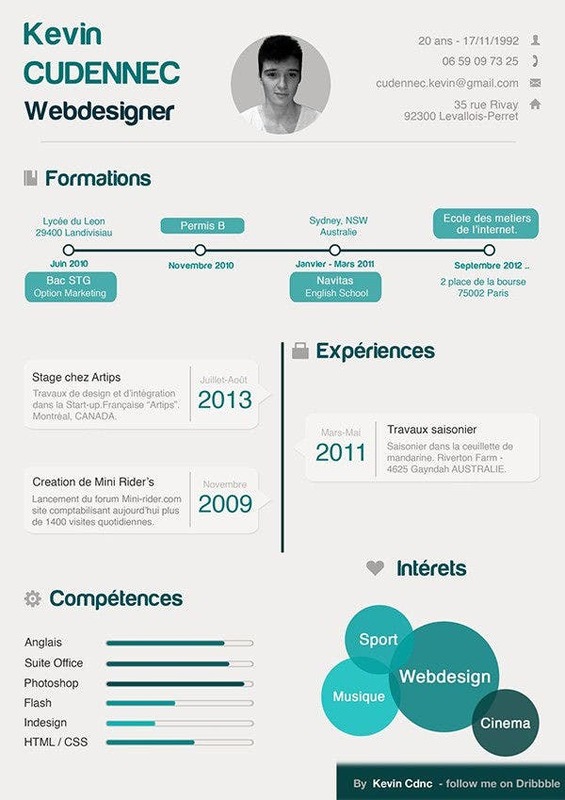 The internet presents variety for someone in need of infographic CV design. 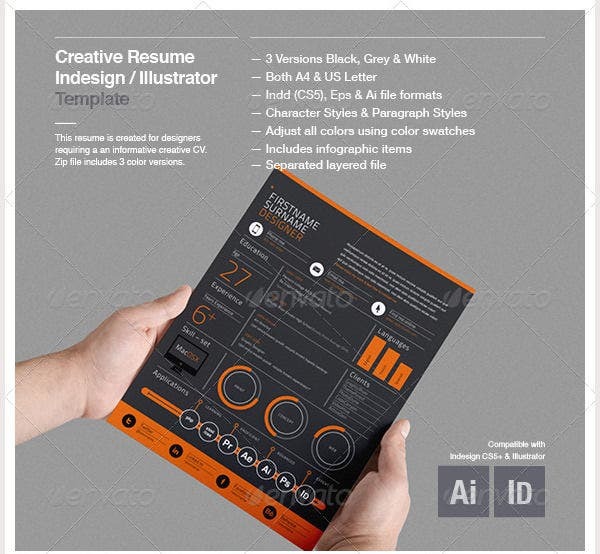 Hence, even if you require an adobe illustrator resume template, there should not be any disappointments. > How Does One Benefit in Such a Scenario? There is indeed a lot to gain in such a scenario. Let us discuss the positives of such a scenario in brief. 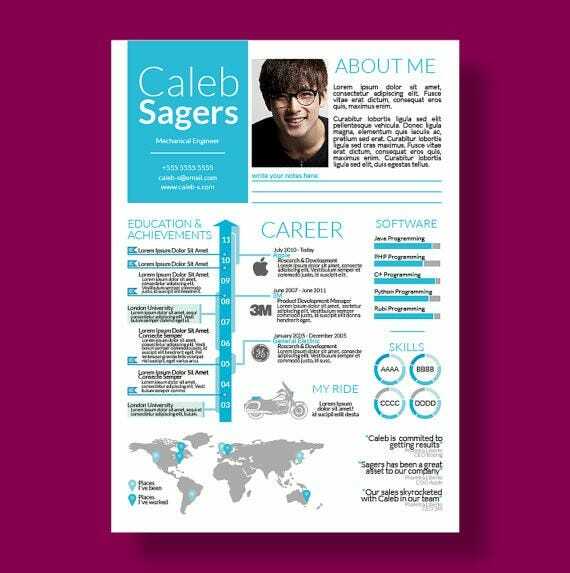 These infographic resume templates are catchy and someone eager to be in the focus of recruiters will love these resumes templates. 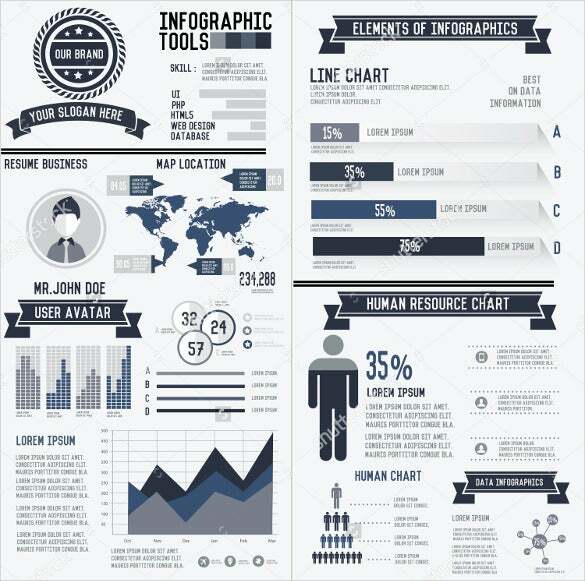 The infographic resume free download option offers two major benefits to a job applicant. Firstly, being a free option, one can get access to these templates without spending in money. Just a computer in place and an internet connection should be enough to have access to these templates. 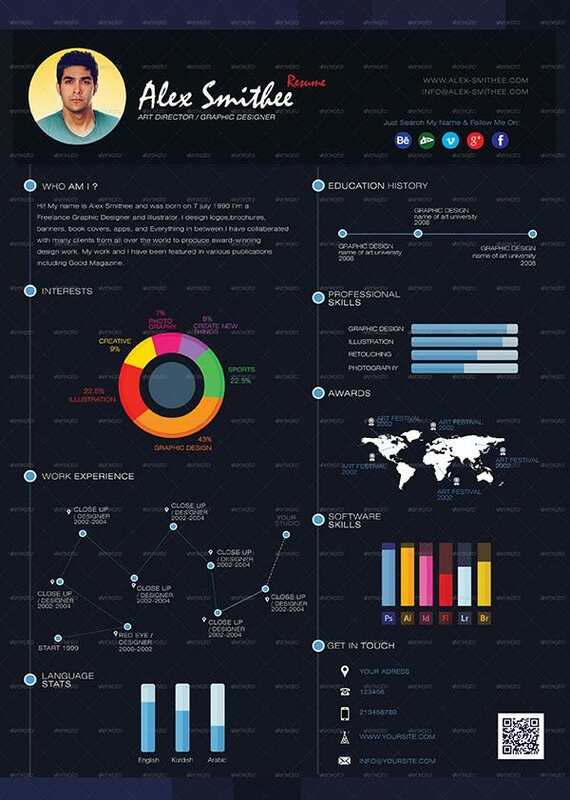 Moreover, being an internet download option, one can quickly get access to these resumes in infographic styles. 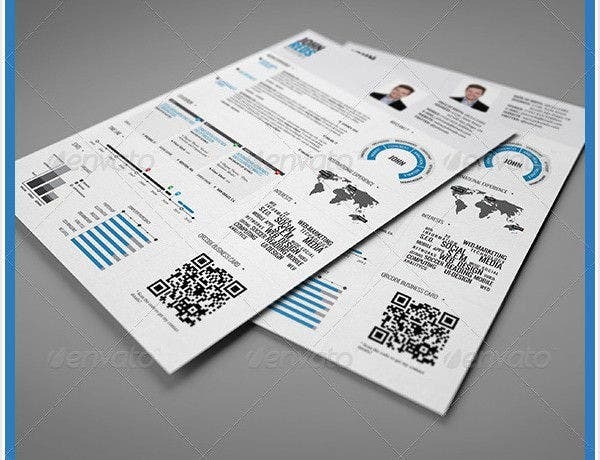 It certainly can create an impact as modern day job data shows candidates with infographic resume designs have been successful in getting jobs. Experts say that it demonstrates your creativity and talent. You can see also word professional resumes. 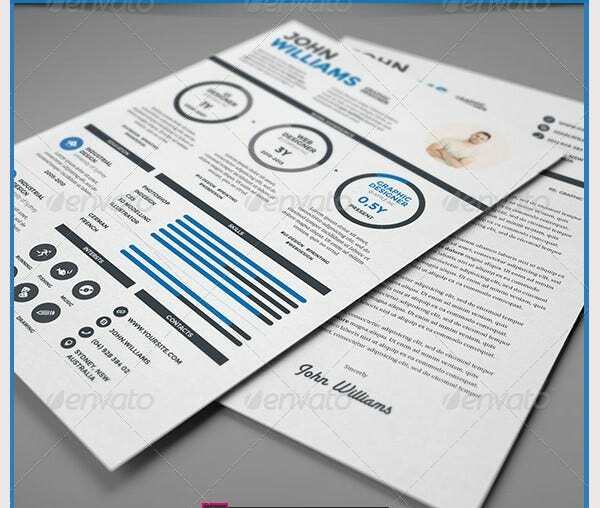 The advent of perfectly designed infographic resume template versions has certainly given that much required boost up to job seekers, who are eager to leave a mark on the minds of recruiters and employers. 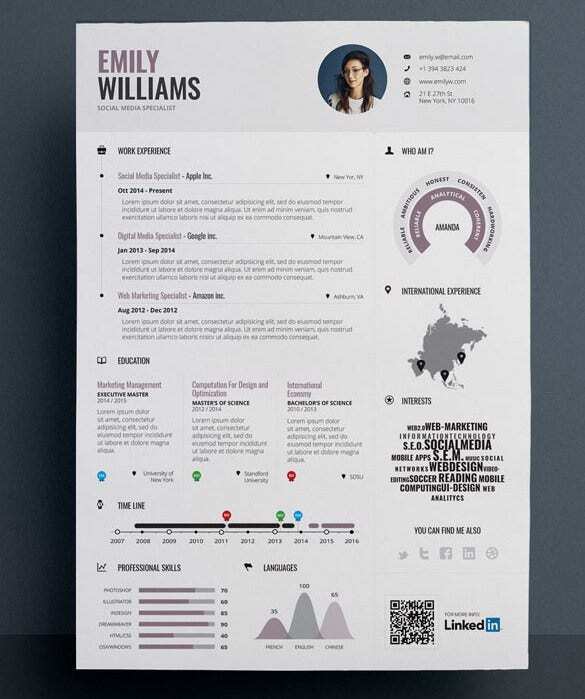 We on our part have looked to offer you some stunning infographic resume template options. 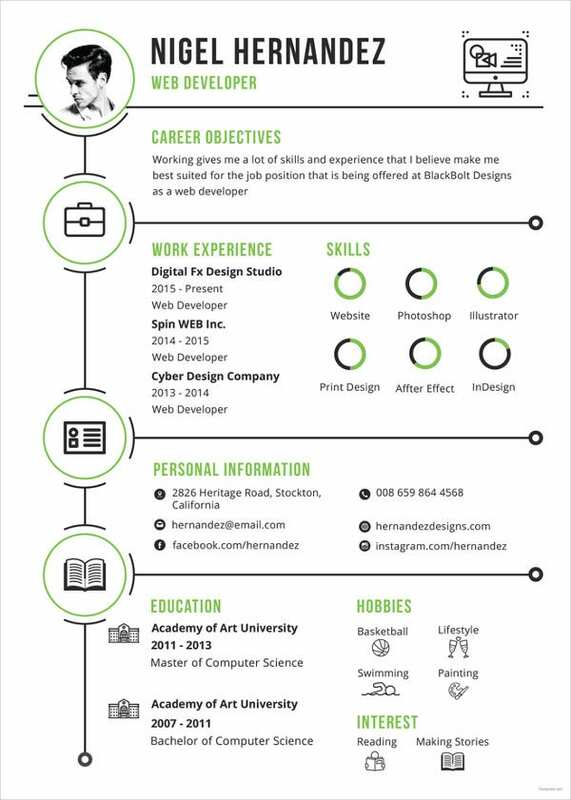 Some of the best professional designers have been working day and night and that is just the reason why we can offer you the best graphic CV example. Carefully browse through our website and you should certainly stumble upon something, which should suit your needs.